Rectangular marble tablet with sloped nowy head. 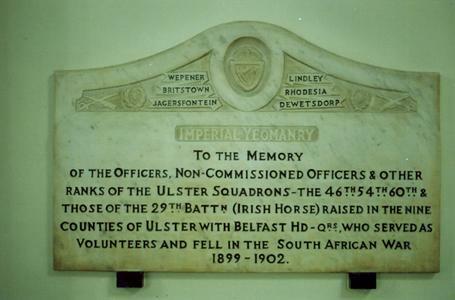 At the top centre of the tablet is an imprint of the regimental badge and to the left and right are the following battle honours, along with crossed sabre and rifles and laurel leafs: WEPENER/ BRITSTOWN/ JAGERSFONTEIN/ LINDLEY/ RHODESIA/ DEWETSDORP. Lettering carved in black. 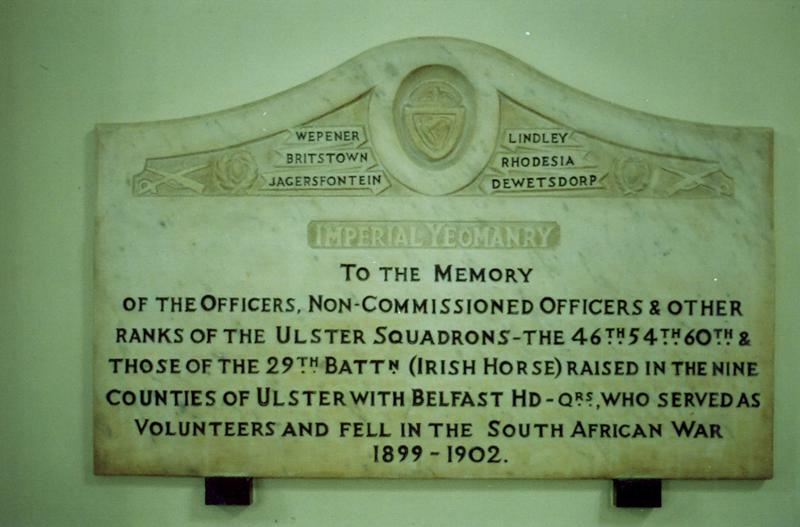 IMPERIAL YEOMANRY/ TO THE MEMORY/ OF THE OFFICERS, NON-COMMISSIONED OFFICERS & OTHER/ RANKS OF THE ULSTER SQUADRONS - THE 46TH 54TH 60TH &/ THOSE OF THE 29TH BATTN (IRISH HORSE) RAISED IN THE NINE/ COUNTIES OF ULSTER WITH BELFAST HD-QRS, WHO SERVED AS/ VOLUNTEERS AND FELL IN THE SOUTH AFRICAN WAR/ 1899-1902.